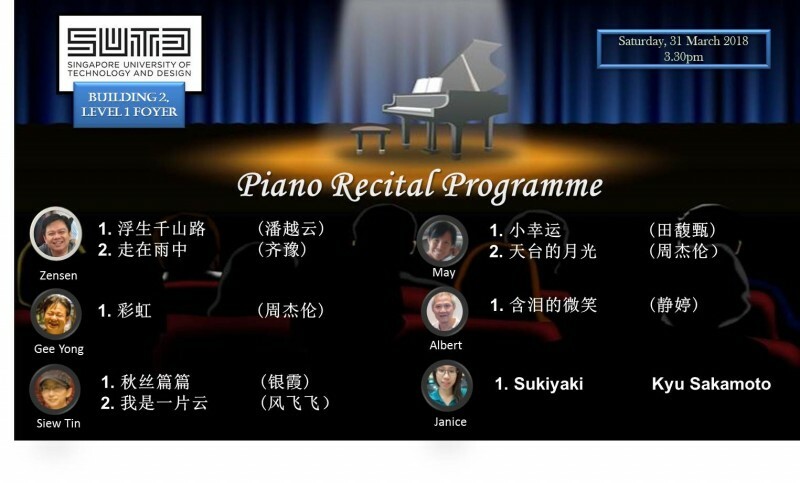 Hi, here is my video for my performance at Pianovers Recital 2018 held on 28th of December. Hope you enjoy watching it. a) Playing on a grand piano has a totally different feel; it was as if I'm on cloud nine. The touch for this Yamaha piano was excellent; it was tuned on the spot prior to the Recital. Make full use of any rehearsal time you have so you can appreciate the feel of the piano, if at all possible. For me, I used the time to try out the sostenuto panel just for the last measure of my song. b) Performing in formal wear has a different feel than playing in civvies in the comfort of your home. Make sure you feel comfortable in your getup and that you have space to maneuver your arms. c) As this was a community driven event, I felt it was OK if you don't memorize your score; you probably wouldn't do this for a professional recital. I was sight reading straight from the sheet music since I am very comfortable doing that, but I will have you know, I did practice the piece probably at least 30 times already; not enough to memorize the song in its entirety, but enough for a great performance. d) If you make a mistake during the performance, press on as best as you can. People might not even know you made a mistake, if you play on as if it's part of the show. Glaring errors are obvious, but try to recover as best as you can and move on. You can always tell Pianovers you want your video kept private if you feel embarrassed by your performance. e) Pick a song you can manage. While, I noticed other performers on that night chose more difficult pieces that showed off their technical prowess, I felt very happy with my choice, a lovely song made famous by Josh Groban. Dont aim for something over the top unless you are very confident performing the piece. If it's an expressive piece, play your heart out. If it's a technical piece, play to impress. f) Don't feel pressured by the audience or get distracted by the photographer. Focus on the performance and doing a great job. It helps if you have practiced a lot at home already. Definitely never come unprepared. g) Bow once before your performance. Bow again after the performance. I felt I probably made a minor gaffe, I picked up my score and had wanted to fold it back before bowing right at the end. I felt I should have bowed first at the end, then picked up my score to exit the stage. Well, that's it. Thanks for reading this far. There are a few versions to The Prayer. I like the Celine Dion + Andrea Bocelli. That's actually the first version I got acquainted with. Yes, that is the best version. I heard that one right after Quest for Camelot's version sung in English only by Celine Dion. The lyrics are very meaningful, especially the Italian version, I have even memorized that version of the song sung by Andrea Bocelli. Bellissimo! Just watched the video. Nice, you got 100+ views! That's a pleasant surprise! Thanks. 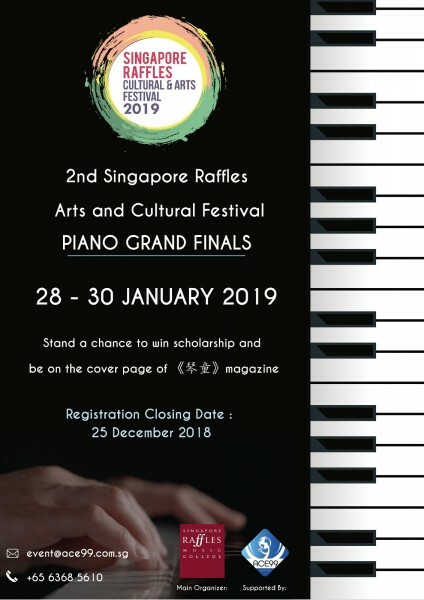 The 2nd Singapore Raffles Arts and Cultural Festival – Piano Grand Finals will be held from 28th - 30 January 2019, at Singapore Raffles Music College and Singapore Chinese Cultural Centre. This festival is organized by Singapore Raffles Music College with the key purpose of providing like-minded musical talents a golden opportunity to hone their performance skills, learn from their fellow participants across the region as well as broaden the participants’ musical horizons and networks! Email us at event@ace99.com.sg or call us at (+65) 6368 5610 for more information. 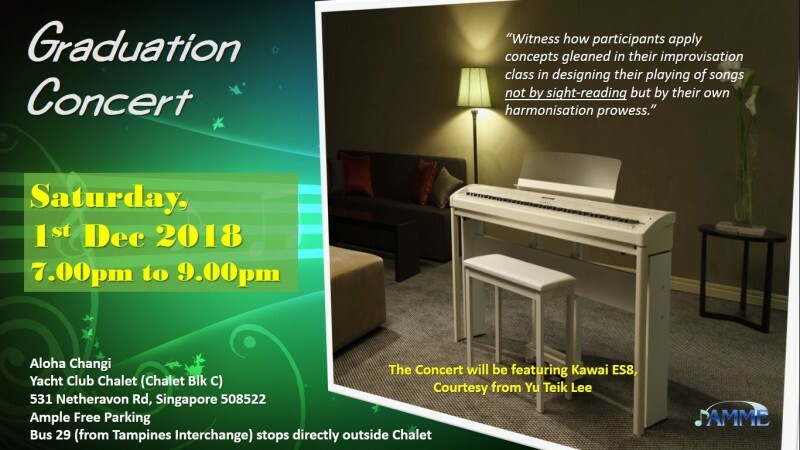 Nice, we should have more piano competitions or piano activities in Singapore. Feel that we can still do more to promote arts and music in Singapore. Many parents still feel their kids can't survive with a job related to music, and must die die have a degree first. Might be a bit too late to share! Hahaha! It's next Tuesday! Love their youtube videos. Keep this date free to see how ten odd participants have made use of what they’ve learnt in improvising their songs of choice. This concert is FREE, though we only have limited seats. Yong Meng and Elyn will be gracing it too! There will be a debrief at each performed piece so that the audience will be cognisant of the musical elements being infused in their improvisations. And feel free to interact and jam with them at the end of the concert, since instruments of various types will be available there! RSVP your attendance by either sending me a PM or email me at acosean@yahoo.com. Hope to see you there! Hope more ?luvers frens going ^+^?? Awkward situation for a pianist #1 - What would you do if you, the pianist, attended a recital all ready to play K.467 and was caught off guard by the starting bars of K.466? Luckily, it was only a lunchtime concert (a rehearsal for the evening concert) for Maria Joao Pires. But, more luckily for her, Maria had played K.466 before and she easily switched gears to play the required piece. Woah, that will be a lot to memorise! I'm still struggling with just one or two pages! Kudos to her! Yes, memorizing is a pain for pianists everywhere. The best I have memorized is a single piece at a time. And nowadays, I just prefer sight reading on the spot, although you can't do that with very fast pieces. piano teachers should be able to sight read even faster pieces? I should think so. If you get your hands on a piece that reads greater than Allegro (eg. Vivace, Presto, and Prestissimo, etc. ), you're at least going to do some music speed reading - be aware of the key and signature, glance through the score to ferret out difficult passages, note all changes to key and signature, repeats, dynamics and other special ornamentation. After that, you could theoretically play the piece at a fast enough rate on the first go, and aim to pick up speed after acclimatizing yourself to the piece. The pain is always memorizing the piece for a performance; well, rote learning helps. Awkward situation for a pianist #5 - When something breaks on the piano, will you panic? Perhaps a string snaps in the middle of your performance, perhaps your score flies off, or perhaps this happens to you... your chair breaks... Ouch! Has something similar ever happened to you? Did you keep your cool and continue? Bottomline: Beware your eyes when a piano string snaps. Won't have time to react if it really snaps. No? Very unlikely that it could hurt someone though. Never heard such news before - "Man attacked by slashing piano wire". Sounds like something I would read in the tabloids. Keke.. I also never heard of.. and certainly hope it won't happen to anyone. Awkward situation for a pianist #4 - Cell phones! Bleeping and blooping in the middle of the concert hall? Oh no... please don't make it awkward for the pianist. Always remember to turn it to silent mode. Please. Listen to Christen Zacharias' views on disturbed concerts. Would it happen in Singapore too? Share any experiences you have. Thanks. Awkward situation for a pianist #3 - Well, page turners better pay attention, because if you make a mistake, the pianist will create a blunder - big time! Maybe, it's time all pianists invest in a page-turning app. Concert FAIL J. G. Rheinberger Tarantella "zwei Klaviere zu acht Händen"
Awkward situation for a pianist #2 - What happens if you had a stuck pedal problem during your recital? Here's how Brazilian pianist Eliane Rodrigues handled the issue - injecting some "underground" humor into the major hiccup (puns intended). Come support us! SUTD is next to a Downtown Line MRT Station! Wow wow wow! How did it go? How's the crowd on a Sat afternoon? ? It was a success! We were hoping to see you there! I'd love to support you guys! I'm now based overseas, however. Keep it up! ?